Eggplant unlikely veggie for many people. The spongy-mushy texture of Eggplant or for it’s the slightly bitter taste. But My today’s recipe will be a great eggplant veg recipe for those people who don’t like eggplant at all. This stir fry eggplant recipe is one of my favourite dishes and I believe this is the most delicious Recipe of Eggplant. Though it’s a Korean dish I used Chinese eggplant. Because Chinese eggplant Cooks fast than other kinds of eggplants. Usually, Chinese eggplant comes with a long shape and this kind of eggplant has a lighter taste and it has thinner skin compared to the other eggplants sold in the Asian market as well as in non-Asian grocery/veggie store. 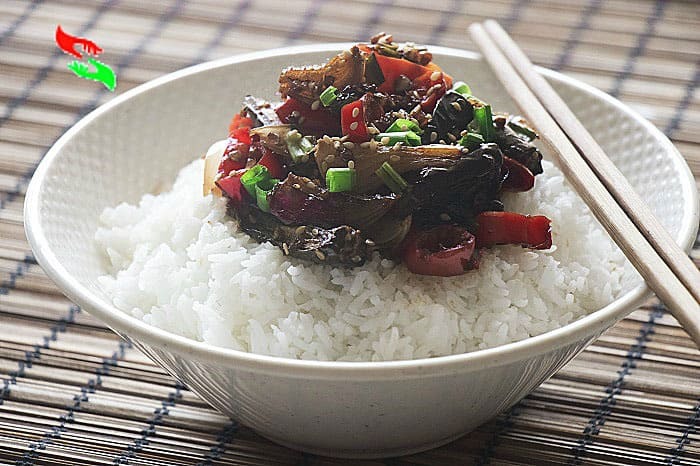 If you don’t find Chinese eggplant, you feel free to use other types of eggplants to make this stir-fry dish. But make sure you are adjusting the cooking time a little bit which I am sharing. Use Eggplant pieces to make the dish after frying or steaming. But if you do not want really to do steamed or fry the eggplants then you can AIRFRY the eggplant pieces as I did. Cook all the eggplant pieces until to get soft texture, I simply stir-fried the eggplants together with few simple ingredients as well as with all the seasonings for a couple of minutes and the dish is ready to serve. Enjoy this dish with a bowl of hot white steamed rice. If you are really looking for an easy/quick tasty eggplant recipe, this recipe would not let you down. This vegan dish is better than takeout at the weekend and it’s not only a quick recipe it contains half the calories of another dish also. What is ‘Gaji Bokkeum’ IN KOREAN LANGUAGE? soy sauce, rice wine/mirin and at the end adding some roasted sesame seed for extra crunch and flavor and splash of toasted sesame oil to add extra aroma to the dish. What do you think? It is so easy and quick to make, isn’t it? I hope it is. And you will make the dish same with help of my recipe. And will enjoy the dish with a bowl of hot steamed plain rice or make the dish more special by serving the dish with a plate or bowl of Jasmin rice. Why am I making this Korean stir fry eggplant dish? The main cause to make this dish is very easy to make and its taste great. This can be very easy to make but so flavorful side dish in your busy party day. This is one of my favorite way to cook eggplants veggie. And this dish also Looks wonderful with its dark-purple color and shiny skin. 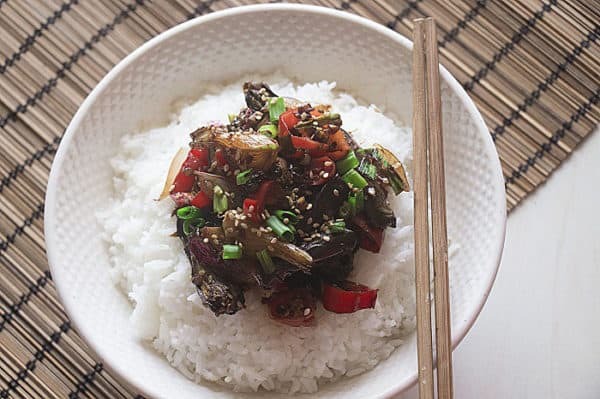 Eggplants are stir-fried with simple seasonings and Korean red chili pepper paste(Optional ingredient) adds a nice kick to this eggplants dish. This is a simple veg version of the dish. But you can also make the dish with a non-vegetarian variation adding some sliced pork or chicken. And then you can enjoy This stir fry eggplant as a full meal or as a main dish. I use 1 or 2 pinch or salt not more because lite soy sauce is quite salty.So use the salt carefully in this recipe. 1 Tbsp Any Vegetable oil/I used extra lite olive oil Oil you can use more or less in this dish.I used ! tbsp because I Air fry all the eggplant slices with little oil and suger before start the cooking. 1/2 Tsp Roasted sesame seeds to sprinkle from the top of the dish. Make the pan heat enough. One the pan is hot put the oil into the pan and make the oil hot too. How to put chopped garlic and red chilis and pre-fried eggplant slices and shallots to the pan and fry over the very high heat just for few seconds. Then very quickly add soy sauce, Rice wine vinegar or mirin, sugar, salt and pepper and of course roasted sesame seeds and roasted sesame seed oils to the pan. Toss the all ingredients over the high flame and coat all the sauces with eggplants and other ingredients very well. do the tossing process within few seconds not more than it.and then turn off the flame. Now The stir-fry eggplant dish is ready to serve. Now serve the dish over the steamed plain white rice and sprinkle some sesame seeds and chopped spring onions/scallions from the top of the dish. To make the look of the dish more Delicious.